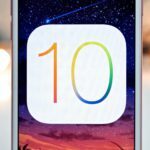 With all the excitement around iOS 11, it is no surprise that many users eagerly anticipate their next iPhone software download. We all want to upgrade our iPhones and iPads to the latest iOS. And this time around, Apple’s iOS 11 offers many new and innovative features, in particular for the iPad. Upgrading an iPhone or iPad to the latest Apple’s iOS version is typically quick, easy, and trouble-free. But there are times when this initial excitement leads to immediate annoyance, especially if your device shows the message error occurred installing iOS 11, iOS unable to verify update or other iOS 11 install problems. So if you are experiencing iPhone update problems, here are some tips and tricks to help you download and install iOS 11. 3 Seeing iOS 11 failed verification because you are no longer connected to the internet? 4 Switching over from iOS 11 Beta to General Release? 5 iOS 11 Not Installing? Stuck? Or Seeing Message Unable to Install Update? 5.1 Delete the Stuck or Partial iOS 11 Update First! 6 No Space? Use iTunes! 6.2 iOS 11’s Great Storage News! 10 Is it a Widespread Carrier Problem? 11 Done Updating But Now iOS has Problems with Your iPhone or iPad? If you have not yet updated your iPhone or iPad with the latest iOS update, do yourself a favor and make sure that you back up your device. We recommend that you back your device into iTunes and well as iCloud. Better Safe than Sorry. Check out our comprehensive guide that walks you through all the various aspects of backing up your device. The second important tip for those of you who have not installed the latest iOS 11 and are planning to update soon is to make sure that your iPhone has enough storage. If you have been getting “iPhone out of Storage” notifications for a while, please make sure to optimize and free some storage before proceeding with the iOS 11 install. 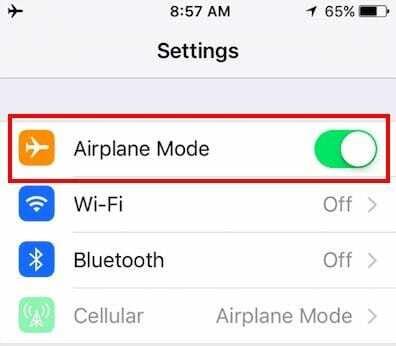 Please make sure that your iPhone or iPad is connected to power (preferred) or has sufficient charge to make it through the upgrade. If you’re unsure, charge your device before attempting to upgrade or just plug it in and then update. We know that OTA (Over the Air) updates are the most convenient and easy to perform and most users try to upgrade their device using OTA. Unfortunately, we have found that when major iOS updates are concerned, OTA installation process often causes a lot more hiccups. Sometimes, these are not Apple related. You could be on a weak Wi-Fi network during the install or access the Apple Servers when they are too busy with many users trying to upgrade at the same time. For that reason, we recommend that you update iPhone software manually, using iTunes. If you have experienced iOS install issues during the past with OTA updates on your iPhone or iPad, consider updating your iDevice via iTunes. It is easy and very convenient to do an update via iTunes as well. 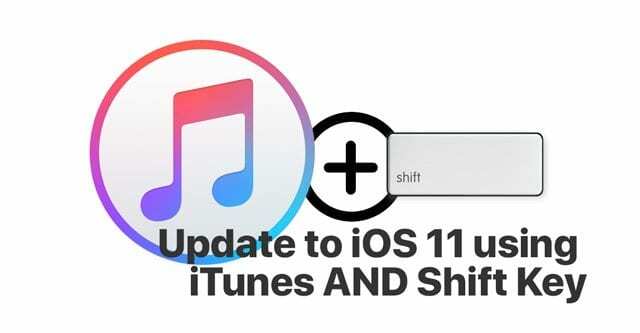 If you experience updating issues or other problems/errors after an OTA update, connect to iTunes and press and hold the SHIFT KEY and click on UPDATE. This method installs iOS 11 via iTunes without any data loss. In the next few sections, we address some of the most common issues associated with the upgrade process. Cannot Find the iOS 11 Update? This scene is a common problem that happens during most upgrades. When you tap on Settings > General > Software Update, you cannot find the new update. The familiar red icon that shows up next to General when you are in Settings is not there. 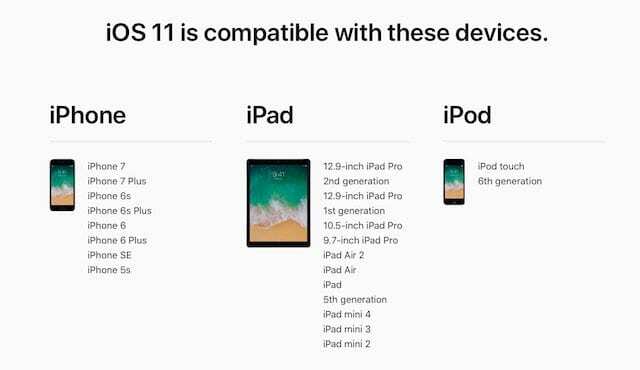 If your device is a 32-bit device, it is not compatible with iOS 11. Sorry folks! 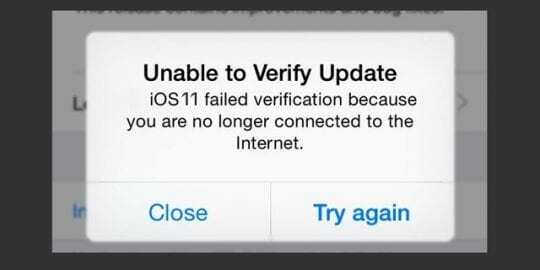 Seeing iOS 11 failed verification because you are no longer connected to the internet? Sometimes this happens when your wi-fi signal or cellular strength is weak. Disconnecting and reconnecting your device with your Wi-fi often solves this issue. Remember, in the first few days/weeks following an iOS release, requests for iOS swamp the Apple servers, and it often takes some time for your iPhone or iPad to show the required update. Switching over from iOS 11 Beta to General Release? Some of you may have been running the iOS 11 Beta on your iPhone or iPad before the general iOS 11 release showed up. 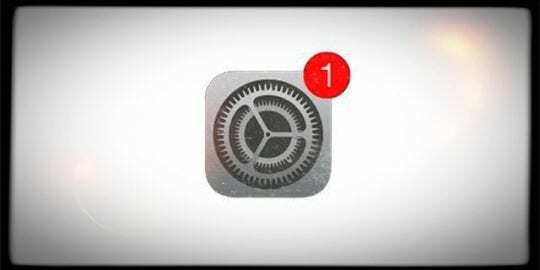 If you are unable to find the general iOS 11 update patch on your iPhone or iPad, you may want to uninstall the Beta from your device and restore it to the regular iOS version. Connect your iPhone or iPad to your computer running the latest version of iTunes. Next, put your device into Recovery mode. For iPhone 8 or iPhone 8 Plus: Press and quickly release the Volume Up button. Then press and quickly release the Volume Down button. Finally, press and hold the Side button until you see the Apple logo. Continue to hold both buttons until you see the recovery mode screen. Once you are in the recovery mode screen, click on “Restore.” This action deletes the iOS beta from your iPhone or iPad and loads it with the latest regular iOS. For most users, restoring resets the device to iOS 11 via iTunes, as this is available via iTunes. iOS 11 Not Installing? Stuck? Or Seeing Message Unable to Install Update? This section provides you with tips that will help you when you have a stuck iOS 11 update or when the install simply doesn’t finish, and your iPhone appears bricked. It is a good idea at this point to check your Wi-Fi strength. If you think your ISP is slow for some reason, try switching it to the free Google DNS or OpenDNS. Delete the Stuck or Partial iOS 11 Update First! Before attempting to rerun the iOS Update on your iPhone or iPad, we strongly recommend that you check for a partial update on your device and delete it. If you or Apple do not remove this partial update from storage, it can cause significant problems during the iOS re-install process. To check this issue, check your settings. Once you have removed the unpacked OTA, try again to update your iDevice to iOS 11. 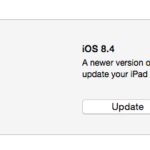 A safer bet here is to switch to iTunes and not do the update via OTA. If you encounter “Out of Space” errors while updating to iOS 11 wirelessly (OTA), follow the iTunes update method. This downloads the latest iOS 11 updates onto your iPhone or iPad, and you may not have to do anything with trying to recover space on your device for the upgrade. 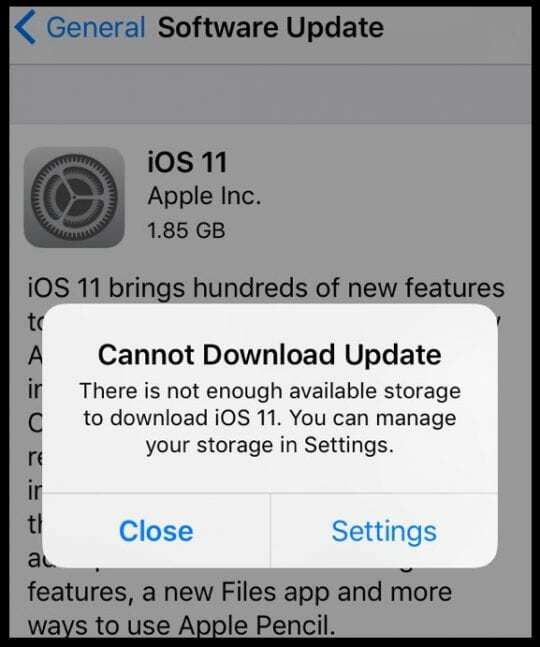 Need Another Option When There Isn’t Enough Storage to Download iOS 11? Delete some apps especially ones you don’t use, dispose of any deleted voicemails, turn on iCloud Photo Library & optimize your Photos, delete some music or videos temporarily, and clean out your recently deleted photos. 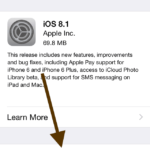 These are just a few tips to get some storage back for your iOS download and install. For more tips on cleaning out all that clutter to make space for your iOS upgrade, check out this article designed especially for those of us with small storage iPhones! iOS 11’s Great Storage News! iOS 11 includes some amazing storage management tools, so next time around clearing out space won’t be such a nightmare! Some users find that following the install of iOS, their iPad has gone into an endless loop of asking for the Touch ID or Passcode. 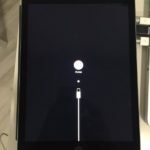 If your iPad/iPhone will boot, but not unlock the only way to get it back was to use “Find iPhone” on another device, and remote wipe the problematic iPhone. The other common issue along the lines of the passcode is that your iPhone or iPad requests a six-digit passcode and you had never set one up. This can be a little confusing, and we saw many users struggle with this issue during iOS 10 rollout. 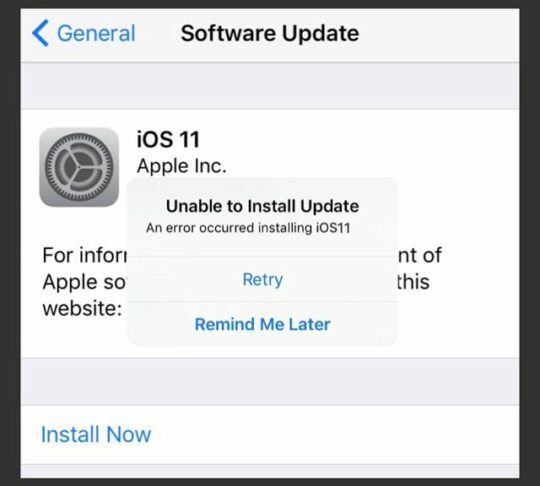 If you are facing this problem with iOS 11 install, please click on the article below. It’s not just Apple that offers links to an ios firmware download. You’ll find some third-party sites offering the current (or previous) version of Apple’s iOS Firmware. FYI, an IPSW file is an iOS firmware restore file–usually used to downgrade iOS unofficially. If things really aren’t working, don’t be tempted to give these ipsw download links a try and update to iOS 11 using some third-party sites. Is NOT okay to use IPSW files downloaded from non-Apple websites and then use these ipsw files to update/restore ANY Apple device. Stick with Apple only! Why? The reason is security, plain and simple. Is it a Widespread Carrier Problem? Some users with Vodafone experienced issues when the iOS 11 initially launched at a beta release. This was then later corrected. If your carrier is having issues with the iOS 11 update, your best bet is to call your carrier and see if the problem is more widespread than your iPhone. Sometimes in these cases, Apple releases a new update immediately within the next day or so. Done Updating But Now iOS has Problems with Your iPhone or iPad? So you finally updated your iDevice to iOS 11, whew! But then things fall apart–you can’t find AirDrop, Safari Bookmarks have disappeared, your Mail or Messages app isn’t working, photos and videos are missing, or maybe you can’t connect to the App Store. These are all common problems following a major iOS update. But when you experience these problems, they certainly make your device less handy. So if you are unfortunate with these types of post-update problems, take a look at our article on how to fix the top iOS problems AFTER an update. My boss recently asked me how to update iPhone without iTunes or wifi mainly because our company’s iPhones cannot connect to wifi or a connected instance of iTunes. We need to update iOS using a standalone iTunes client that doesn’t communicate with Apple’s Servers. After a lot of research, it looks like the answer is no, you cannot update any iOS device without connecting directly to an Apple server. Wanted to share, just in case others have similar problems at the office. In some countries, you must use a VPN to update. Updating iPhones and iPads are usually very easy–it just works! But sometimes, things fall apart–our internet goes down, iOS updates get stuck, an error occurred installing iOS, and other problems. These tips should help most of us get through the process, with only a little inconvenience. If you discovered other methods that worked, please share them with us so we can share with other readers stuck in the same boat when trying to update iPhones and iPads. And don’t forget to share the article with your friends, family, co-workers, and neighbors who might be struggling with the iOS 11 update issues. Thanks, this article helped me sort out the issue with updating my iPad Pro to the latest iOS 11 version–11.4, I think. Thanks again–used iTunes to update and no more problems. I m using iPhone 7 plus. I clicked download and install button for IOS11, it doesn’t proceed. It just show ‘checking status’ and hang. I tried many times already. Can you help? Sorry to hear about your issues with downloading the latest iOS 11. Do you have access to a computer using iTunes? If so, try using iTunes to update your device. It’s also possible that your device doesn’t have sufficient free memory–so make sure you check that before proceeding. To check, go to Settings > General > iPhone Storage and look at how much internal (device) storage is available for the update. If your storage is near full, free up some space following these directions. If you haven’t already tried, reset your network settings (Settings > General > Reset > Reset Network Settings) then restart your phone and try to update again. As a reminder, make sure you backup your device before updating! If at all possible, please try and update via iTunes. It doesn’t have to be your computer, any PC or Mac with iTunes will do. 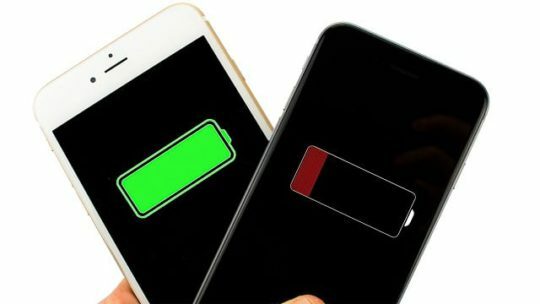 If that’s not possible, force restart your iPhone 6S by pressing both Home and Power and maintain this hold until the Apple Logo appears on-screen, then release. Check your WiFi network and make sure it’s connected to your fastest and most stable netowrk. Then try updating again. I have tapped “download and install” but nothing is happening? No error message, nothing. The download and install continues to be highlighted. Any thoughts? Sorry, you’re having trouble installing the latest iOS update. It sounds like your iPhone or iDevice is not connecting to Apple’s Servers–this could be due to a problem on Apple’s side or a problem with the stability of your current internet connection. Our suggestion, if possible, is to update via iTunes. Updating with iTunes is almost always a more stable update environment for any iDevice. To update with iTunes, it does not need to be your personal computer–it can be any computer, as long as it has the latest version of iTunes installed. You can even go to an Apple Store and update in-store–Apple resellers (like Best Buy) are also supposed to allow current Apple device customers the option of using iTunes in their stores to update as well. If iTunes is not a possibility, we suggest trying to update using a different WiFi network OR waiting till early in the morning or late a night, when Apple Servers see less traffic. Keep us posted! And good luck. I made space on my phone, I deleted and re downloaded the update three times already and there is still an error. I don’t have my laptop anymore to update it through there. I installed iTunes using windows, but I can’t find a summary wherein to click updates…. huhuhu 🙁 what will I do now? Look for the iPhone symbol in the upper left and select that, your should then see the Summary in the main window. If not, you should see Summary listed in the left-side column. Let me know if you still aren’t locating your device. Been trying to update my Iphone6 plus to iOS 11 but to no avail it always says “Unable to Install Update” – an error occurred installing iOS11. 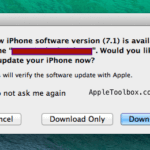 Are you able to update using iTunes? We recommend using iTunes to update if at all possible, as it is much more stable than the Over-The-Air update. If that’s not possible, let us know. Try using iOS 11’s new storage tool called Offloading Apps. This allows you to delete an app BUT NOT delete your documents and data. When you reinstall the app, it will automatically grab the most recent and updated version from the App Store. And then reconnect all your documents and data into the app. We have tested this on numerous apps, including third-party apps and had no problems reconnecting data to the app. However, we have not tried it on Video DL so there is always a chance you will lose data. 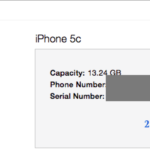 For this reason, please backup your iDevice before you offload the app–use iCloud or iTunes. To offload, got to Settings > General > iPhone Storage and locate your app. Tap on that app and select Offload App. One offloaded, restart your device by powering off and then back on. Then reinstall that app going through that same process, except this time instead of offload, choose Reinstall App. Perform this when connected to WIFI, not cellular just in case the file size is large. 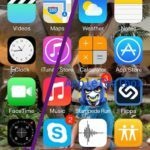 For more detailed info on offloading apps, check out this article. Hopefully, this method works for you. Depending on how many times you tried, you may need to wait up to 24-48 hours to continue. Updated to new ios with iphone 6s. Update worked fine but now my keyboard often vibrates and erases the letter i pushed when typing. Makes it frustrating to text. How do I fix this? I updated my ipad and it asked for my ID code. Now it’s giving me a message that says “try again in 15 minutes” and then counts down. This is happening every time. What should I do? That usually means that an incorrect passcode has been entered. Stop trying to enter that code and instead go to another device or computer and confirm your Apple ID and password using Apple’s site. If you forgot your credentials, follow the directions to recover your disabled Apple ID. I did the update, when it restarts it asks for my apple id , i put the password and agree to the terms and conditions. Then it says it will take a few minutes to connect to app store, but after a few seconds it says it could not sign in and i have to start all over. Users are currently reporting a problem with Apple’s Signing Servers–these are part of that iCloud process that’s giving you problems. So it’s on Apple end to fix the signing issue. You can try to update via iTunes, that might make a difference. First, there are some issues today with Apple’s Signing Servers–so easiest course of action is to wait until tomorrow or a few more days. But if that’s not your cup of team, try the following. However, if the Apple Server issue is big, there might be no way around it until it’s fixed! If you still get this error using iTunes, try updating OTA using Settings > General > Software Update. You’re able to turn Find My iPhone/iPad on once the update completes. There are user reports of issues today with Apple’s Signing Servers–and these are completely out of your control–or anyone’s BUT APPLE. So easiest course of action is to wait until tomorrow or a few more days. You can try the following, but it may or may not help depending on how widespread the problems are with Apple Servers. I can think of a couple additional things to check. First, are there any restrictions on your iPhone–go to Settings > General > Restrictions and check if this is ON. If so, enter your Restrictions passcode (a four-digit code that’s usually different than your iPhone passcode) and disable all Restrictions. If that’s already off, perform a All Settings Reset by going to Settings > General > Reset > Reset All Settings. This removes things like WiFi passwords, personalized brightness, volume, and other settings preferences–and sets them back to defaults. So if some setting is your issue, this should clear it out. If these additional tips don’t help, it’s time to call Apple directly. Here’s the list of worldwide support information. Find your country or region and call Apple Support. Mention all the steps you’ve already taken to get your iOS 11 install and the problems encountered. If any specific error codes showed, reference those as well. Keep me posted. And if you learn of any additional ways to overcome this install error, please let us know. I’m sure others out there are facing similar problems–and frustrations! I have tried so many times to update my iphone but still it can’t install unable to install please try again later. What should I do ? Is it normal? Depending on your internet connection, some things can take a lot of time and Apple Servers might have very high volume, resulting in things taking a lot of time. If you continue to see this screen for many hours and you made a backup before installing iOS 11, try a forced restart by pressing the power button and volume down button and maintain this press until you see the Apple Logo on-screen. 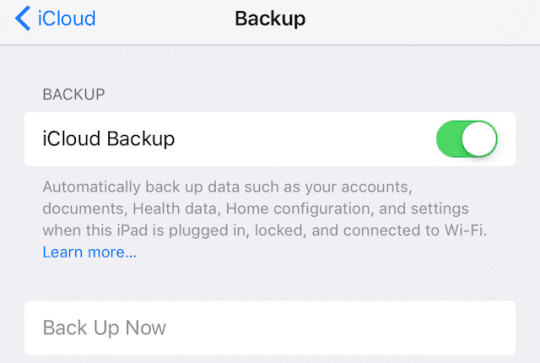 If you don’t have a backup, you can still try this–but there is a risk of data loss since you don’t have a backup. If that doesn’t do anything, try installing iOS 11 via iTunes. And if nothing is working, you probably need to restore your iPhone, preferably via iTunes. Are you able to update via iTunes? If yes, try this route–it tends to be a lot more stable. If not, don’t worry, this error probably is indicative of the volume of traffic trying to update right now–in these first days of release. Try at a time with less traffic, like late evenings or early mornings. OR wait a few more days, even a week. If you really want it now, the most important thing is to be connected to a fast network to download the install files–they are quite large so it’s always best to download when connected to a fast WiFi network. Thank you for the further details on your iPad model. Have you tried updating via iTunes? Sometimes updates don’t show up using OTA (over-the-air) but DO show up when connecting to a computer and updating via iTunes. So if you haven’t already tried this method, do so now. I’d also suggest restarting your iPad by powering down and powering back up before completing your update if it’s available. If you see this message, it means your device is not compatible with iOS 11 because your iPad is an older, 32-bit model device. So the last update to your device is iOS 10.3.2–unless Apple changes iOS 11’s requirements and compatibility in the future. But we don’t expect that to happen. Perform a forced restart on your device by pressing Power and Home buttons (or Volume Down for iPhones without mechanical homes.) Maintain this hold until you see the Apple Logo on-screen, then release. Once your device restarts, go back to Settings > General > Software Update and see if you can install it without errors. If not, it’s also possible that too many people are trying to update at once, so wait a few days, weeks, or try in off hours to see if things improve. Thanks for that information. We’re adding it into our reader tips section. Appreciate it. I updated to IOS11 today and the History bookmark in Safari has disappeared. See if the update turned off iCloud syncing with Safari. If it’s on, toggle it off and then back on. If off, toggle on. Sometimes a simple restart is all you need—just power off and power back on. And if that’s not helpful, try force restarting by holding down both power and home (or volume down) buttons until you see the Apple Logo. Holding down the SHIFT key was the key for me! Thanks!